As a fiscal policy wonk, I’ve come across depressing examples of counterproductive tax provisions (health benefits exclusion, ethanol credits) and spending programs (the entire HUD budget, OECD subsidies). But the folks who work on regulatory policy may get exposed to the most inane government policies (Fannie-Freddie mandate, EEOC rulings). For example, consider how the government is undermining public health by going after e-cigarettes. Sally Satel of the American Enterprise Institute offers a good introduction to the issue. Strikingly, it is members of the public health establishment that have fanned the pessimism surrounding the battery-powered devices that deliver nicotine without the carcinogenic tar. One leading culprit is the Centers for Disease Control which refuses to acknowledge the steep risk reduction for smokers who switch to non-combustible tobacco, overlooks evidence of immediate gains in respiratory health when e-cigarettes are used as an alternative to smoking, and dramatizes as yet unrealized harm to children. …at the heart of this skepticism in the US is the FDA, who has devised an onerous rule that “deems” e-cigarettes to be tobacco products and thus subject to the same regulatory regime as combustible cigarettes. The rule…places undue regulatory burden and cost on vaping manufacturers. …the agency’s mandate for manufacturers to submit data prior to product approval is deeply misguided. Although patterns of youth uptake, flavor preferences, and nicotine level preferences are important data, they do not trump the benefit to adult smokers’ health. …The regulatory politics of non-combustible nicotine products stand as one of the great paradoxes in public health. While our health agencies now strongly champion harm reduction for opiate misuse, they are making it more and more difficult to improve and save the lives of smokers. The Orange County Register is not a big fan of what’s been happening. There’s a strange anti-vaping hysteria hitting governments. …The itch to treat vaping like smoking afflicting so many public health activists and government officials may be well-intentioned, but it is also misguided and harmful to the very goal of reducing smoking which these campaigners claim to champion. …Vapor products offer a way to consume nicotine without inhaling the lethal smoke that causes cancer and kills smokers. It has long been known that it is the smoke from burning tobacco, not the nicotine, that kills smokers. …Flavors are a critical ingredient to the success of tobacco harm reduction. According to a 2013 study published in the International Journal of Environmental Research and Public Health, of 4,618 vapers surveyed, more than 91 percent classified themselves as “former” smokers, with the majority saying flavor variety was “very important” to their efforts to quit smoking. The study also found the number of flavors a vaper used was independently associated with quitting smoking. Supporters of flavor bans argue these products appeal to children and will induce them to start smoking cigarettes. But the data fails to bear this out. A 2015 study from the Journal of Nicotine & Tobacco Research found nonsmoking teens’ interest in e-cigarettes was “very low” and didn’t change with the availability of flavors. Looking at this debate motivated me to write an article on the story behind the story. In an ideal world, the discussion and debate about how (or if) to tax e-cigarettes, heat-not-burn, and other tobacco harm-reduction products would be guided by science. …In the real world, however, politicians are guided by other factors. There are two things to understand… First, this is a battle over tax revenue. Politicians are concerned that they will lose tax revenue if a substantial number of smokers switch to options such as vaping. …Second, this is a quasi-ideological fight. Not about capitalism versus socialism, or big government versus small government. It’s basically a fight over paternalism, or a battle over goals. For all intents and purposes, the question is whether lawmakers should seek to simultaneously discourage both tobacco use and vaping because both carry some risk (and perhaps because both are considered vices for the lower classes)? Or should they welcome vaping since it leads to harm reduction as smokers shift to a dramatically safer way of consuming nicotine? I used an analogy from the world of statistics. …researchers presumably always recognize the dangers of certain types of mistakes, known as Type I errors (also known as a “false positive”) and Type II errors (also known as a “false negative”). …The advocates of high taxes on e-cigarettes and other non-combustible products are fixated on the possibility that vaping will entice some people into the market. Maybe vaping will even act as a gateway to smoking. So, they want high taxes on vaping, akin to high taxes on tobacco, even though the net result is that this leads many smokers to stick with cigarettes instead of making a switch to less harmful products. …At some point in the future, observers may joke that one side is willing to accept more smoking if one teenager forgoes vaping while the other side is willing to have lots of vapers if it means one less smoker. 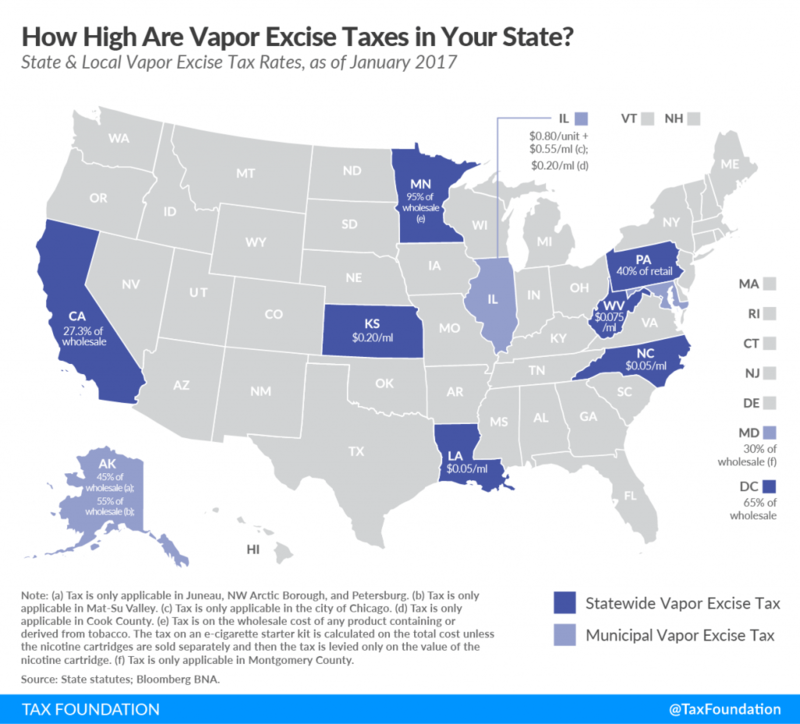 On the issue of taxes, here’s a 2017 map from the Tax Foundation that shows state excise taxes on vaping. There has been some pushback against the regulators. The electronic cigarette industry and its free-market allies are seeing fresh opportunities to ease federal rules on e-cigarettes… More than a dozen conservative groups wrote to congressional leaders…, calling on them to add a pro-vaping provision to a spending measure… A rule issued…by the Obama administration “deems” e-cigarettes to be tobacco products and allows the FDA to retroactively examine all tobacco products on the market in February 2007. …industry advocates say the costly FDA approval process would force most e-cigarette companies to shut down. …The notion of “harm reduction” is the main argument pro-vaping forces use in their push to remove the requirement that tobacco companies retroactively prove their e-cigarettes are safe. For what it’s worth, the FDA has kicked the can down the road, basically postponing its harsh new regulatory regime until 2022. In the world of business, that’s just around the corner. Especially since investors and entrepreneurs have relatively long time horizons. So let’s look at some evidence that hopefully will lead the bureaucrats at the FDA to make rational decisions. The main argument, as noted in this column in the Wall Street Journal, is that vaping is the most effective way of reducing smoking. Two major government surveys show that regular e-cigarette use by people who have never smoked is under 1%. Some 4.2% of high-school seniors report smoking conventional cigarettes daily, according to Monitoring the Future, and 9.7% reported smoking at least once in the previous month. These are “the high-risk youth” we need to worry about… Overheated worries about youth vaping are threatening to obscure the massive potential benefits to the nation’s 38 million cigarette smokers. Two million have already quit thanks to e-cigarettes. Vaping products are already the most widely used quit-smoking tool. And smoking is the real danger to health, as Veronique de Rugy notes in a Reason article. Tobacco kills 480,000 people a year in the United States. Yet when an innovative alternative that delivers nicotine and eliminates 95 percent of the harm of smoking is available, the wary Food and Drug Administration fails to embrace this revolutionary lifesaving technology. All in the name of the children, of course. Using e-cigarettes, known as vaping, has been around long enough for respected health authorities to conclude after many studies that it is eminently safer than smoking cigarettes. Britain’s Royal College of Physicians called any attempts by public officials to discourage smokers from switching to vaping “unjust, irrational and immoral.” …no one wants teens to vape, but we certainly don’t want them to smoke cigarettes and die an agonizing death later in life. As a parent, I tell my children that they shouldn’t do either. But the truth is that I know, as do they, that if they are going to do something as stupid as committing so much of their money to that sort of activity, vaping is the way to go. The bottom line is that government alarmists should back off. The first step is for the FDA to stick to its plan to postpone regulation until 2022 and create a clear pathway for the permanent approval of these products. It would allow the vaping companies time to establish their products as a safer alternative to cigarettes. Here’s some scholarly research on the topic. US tobacco control policies to reduce cigarette use have been effective, but their impact has been relatively slow. This study considers a strategy of switching cigarette smokers to e-cigarette use (‘vaping’) in the USA to accelerate tobacco control progress. …Compared with the Status Quo, replacement of cigarette by e-cigarette use over a 10-year period yields 6.6 million fewer premature deaths with 86.7 million fewer life years lost in the Optimistic Scenario. Under the Pessimistic Scenario, 1.6 million premature deaths are averted with 20.8 million fewer life years lost. The largest gains are among younger cohorts, with a 0.5 gain in average life expectancy projected for the age 15 years cohort in 2016. …Our projections show that a strategy of replacing cigarette smoking with vaping would yield substantial life year gains, even under pessimistic assumptions regarding cessation, initiation and relative harm. And the Wall Street Journal opines on the issue. E-cigarettes do not contain tobacco. They contain nicotine, a chemical derived from tobacco and other plants. Plain English was never a deterrent, though, to regulators on an empire-expanding mission. The Food and Drug Administration this week rolled out new regulations on e-cigarettes based on a 2009 law giving the agency power over products that “contain tobacco.” …Plain English also does not authorize inclusion of e-cigarettes under the 1998 Master Settlement Agreement, the deal struck between the cigarette industry and 46 states that settled a bunch of lawsuits by imposing a government-run cartel to jack up the price of cigarettes (in the name of curbing consumption, naturally) and distribute the excess profits to the states and a handful of now-plutocrat trial lawyers. …Lovers of freedom and enemies of regulatory overkill do not exaggerate when they say FDA rules are designed to murder numerous small manufacturers and thousands of “vape” shops that account for about half the electronic-cigarette business. You won’t be surprised to learn that the bureaucrats at the World Health Organization, who already are pushing for harmonized tobacco taxes, also want to go after vaping. …who gets a say in what the WHO does is a hotly contest matter. Only thirty members of the public and selected members of the media are treated to limited, stage managed press conferences. Nations like China, with state-owned tobacco monopolies, are warmly welcomed, but anyone with the slightest connection to a private tobacco industry is shown the exit. Large pharmaceutical companies generously fund conference attendees, while their anti-tobacco products like Nicorette gum compete with products that the WHO views unfavorably, like electronic cigarettes. The secretive nature of the conference didn’t go over well with India’s tobacco farmers. After a few minutes of protest outside the convention, 500 farmers were corralled by police and detained inside this local police station. …it’s hard to understand why a $4 billion organization like the WHO feels threatened by the average Indian farmer who lives on $3 a day… Expanding its authority beyond tobacco control, e-cigarettes and vape products now find themselves potentially subject to a worldwide ban. Delegates to the convention have expressed support for “a complete ban on the sale, manufacture, import and export of Electronic Nicotine Delivery Systems”. WHO bureaucrats are not the only ones to misbehave. Here’s a column from the Wall Street Journal exposing misbehavior in the United States. There are many reasons to criticize the FDA’s action, but its most fundamental flaw—and the one that our legal foundation raises in three lawsuits on behalf of Ms. Manor and nine others—is that the rule was finalized by someone without authority to do so. The rule was not issued or signed by either the secretary of health and human services or the FDA commissioner, both Senate-confirmed officials. Instead, it was issued and signed by Leslie Kux, a career bureaucrat at FDA. …The attempted delegation of rule-making authority to someone not appointed as an “Officer of the United States” violates one of the most important separation-of-powers clauses in the Constitution. …Political accountability matters; that’s why the Framers included the Appointments Clause in Article II of the U.S. Constitution. Last but not least, here’s a must-watch video on this issue from Prager University. I’m not a big fan of the Food and Drug Administration, mostly because it delays the adoption of life-saving drugs and denies options for critically ill people. Now that it’s going after e-cigarettes and other products that help smokers kick the habit, the FDA bureaucracy deserves ever-greater scorn. Here is a Daniel Mitchell-inspired podcast episode about vaping.